Vacations are the happiest time of the year for most people. Barefoot helps you provide happiness. We offer a full vacation rental management solution with the most tailorable software in the industry. The Best Trust Accounting in Vacation Rentals and Property Management. Let us show you more with a demo tailored to your business needs. 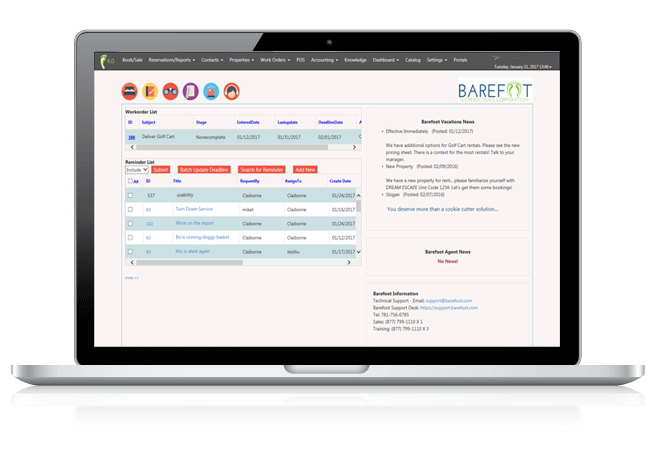 Contact us now for a personalized demo of the Barefoot solution. The Barefoot Agent 4.0 system is the most tailorable tool in the vacation rental industry. Our current focus is on helping our clients become a vacation experience provider, not just a vacation rental company. We are pushing the envelope on concierge and activity management. Contact us to learn more. In this case study, learn why Barefoot client, DeBordieu Rentals, uses Barefoot to help them continue to grow and manage their unique and complex business processes. For additional testimonials, look below or visit our testimonial page. We have many happy customers and we are happy to put you in touch with them to discuss their experience with Barefoot. “As one of the largest vacation rental companies on the East Coast, we were interested in a vacation rental management software that would help us grow. We were also looking for a technology platform that would handle anything our multiple office and state environment could throw at it in the future. After a complete industry review we found what we needed to achieve our goals in Barefoot. "I have been with Barefoot since December of 2008. Even though I may not be the largest client in Barefoot’s stable, they treat me as if I am the most important client they have every time I call. I am confident that when there is something that I need to have changed, or corrected, I can contact them, get suggestions and ideas and whatever work I need will get done in a very timely manner. And I don’t worry about being invoiced for every second they work to help me. Most of the time it is included in my monthly fees, and if I am charged, the costs are always reasonable." Barefoot began with a few key principles.. We understand that everyone does something a little bit differently in the vacation rental and property management market, so build a system that provides the flexibility to address this need. We know that the industry is continuously evolving so we evolve with our functionality as well, as evidenced by our clear understanding of providing a robust API. Finally, we want to deliver what we say we can deliver, and then go from there to exceed your expectations. We approach the market differently. Click below to learn more. We use our industry expertise to help you solve problems, provide insights and work together to create an ongoing solution for you through in-depth, ongoing and satisfying conversations. providing an experienced team to support you.